MUNSON, THOMAS VOLNEY (1843–1913). Thomas Volney Munson, viticulturalist, son of William and Maria (Linley) Munson, was born at Astoria, Illinois, on September 26, 1843. He became one of the leading experts in native American grape species, and his studies were instrumental in saving the European grape and wine industry from disaster during the late nineteenth century. From early childhood, Munson had expressed an interest in horticulture. In the 1860s he taught school in Illinois for three years, and in 1870 he graduated from the University of Kentucky in Lexington. He worked there as a professor of science in 1870–71. He stated the direction his career would take when he declared the grape "the most beautiful, most wholesome and nutritious, most certain and profitable fruit that can be grown." Munson married Ellen Scott Bell on June 27, 1870, and from 1871 to 1873 worked in the nursery business with her father, Charles Stuart Bell. In 1873 the Munsons moved to Nebraska, where Thomas began in earnest his career as a horticulturalist and viticulturalist. He opened a small horticultural nursery in Lincoln. Munson experimented on local rootstock, but found little success because of the area's weather extremes; he once remarked that the droughts, the hard winters, and the grasshoppers made life difficult for a nurseryman. Even so, he began to notice that northern labrusca and vinifera were subject to various diseases, but that native or wild grapes were little attacked by disease. To escape the adverse weather, Munson moved to Denison, Texas, in April 1876. His brothers William Benjamin Munson and J. T. Munson lived in the area and were involved in insurance and real estate businesses; eventually Thomas became involved in a realty business, as well as other endeavors. William spent most of his time with the business, but Thomas began to involve himself with his real love-grapes. He quickly realized the enormous biodiversity of Texas and soon began to conduct wide-ranging collection trips. For the rest of his life he traveled extensively throughout Texas and forty other states, as well as Mexico, covering more than 50,000 miles by rail and hundreds of miles on horseback and by foot. He once wrote that these trips "rekindled my passion for experimental work with grapes." Munson soon began to publish the results of his collection trips and observations. He wrote many articles on the classification, hybridization, and varieties of grapes, published in the American Agriculturalist, Farm and Ranch, and the Revue de Viticulture. In 1883 he received a master of science degree from the State Agricultural and Mechanical College of Kentucky for his thesis, Forests and Forest Trees of Texas, which was eventually published in the American Journal of Forestry. In 1885 he exhibited in New Orleans for the American Horticultural Society a complete classified herbarium of all known species of American grapes. These were displayed in glass frames; he also had plants of the same species growing in pots. Much of this work became the definitive source on grapes for horticultural authorities. In 1893 he exhibited his collection of grape species at the Columbian Exposition in Chicago. Much of Munson's work centered around improving the different varieties of American grapes, and his studies led to the introduction of more than 300 grape varieties. In 1909 he published his Foundations of American Grape Culture, which became the standard reference for grape culture in the United States. Munson's work enabled him to help save the European grape and wine industry from devastating fungus and insect attacks. In the 1840s European vineyards had been ravaged by the fungus parasite oidium. During that time France suffered losses of nearly 80 percent of its vines. The European wine industry imported native labrusca rootstock from the United States, but these cuttings brought in phylloxera, a plant louse, which attacked the slowly recovering vineyards. In 1868 phylloxera was discovered in southern France; more than 6 million acres of vineyards were destroyed in France, Germany, and other regions of Europe. The French wine industry, knowing of Munson's expertise, requested that he send some of the grape hybrid rootstock that he had developed during his studies at Denison. He shipped phylloxera-resistantrootstock to France, where it was grafted with varieties of European vinifera. Munson's work and that of another horticulturalist, Hermann Jaeger, helped save the European wine industry from total devastation. 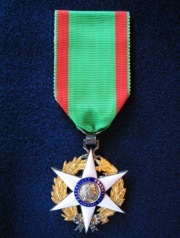 Because of Munson's role, the French government in 1888 sent a delegation to Denison to confer on him the French Legion of Honor Chevalier du Mérite Agricole. Munson also received numerous other awards and honors. In 1898 he was elected as a foreign corresponding member of the Société Nationale d'Agriculture de France and as an honorary member in the Société des Viticulteurs de France. The University of Kentucky awarded him an honorary doctor of science degree in 1906. He was a founder and served as president of the Texas Horticulture Society and was a member of the American Horticultural Society and the American Pomological Society. He was also a member of the Texas World's Fair Commission in 1903–04 and in 1904 was on the International Jury of Awards for the St. Louis Exposition. Munson continued to live in Denison with his wife and seven children until he died, on January 21, 1913. Around 1975 Grayson College in the Sherman-Denison area established a Thomas Volney Munson Memorial Vineyard to recognize Munson's contribution to horticulture and to cultivate and preserve many of the Munson grape varieties. In 1988 the T. V. Munson Viticulture and Enology Center opened next to the vineyard. Several statues honoring Munson have been erected in France.